Images above created by Future Deluxe. 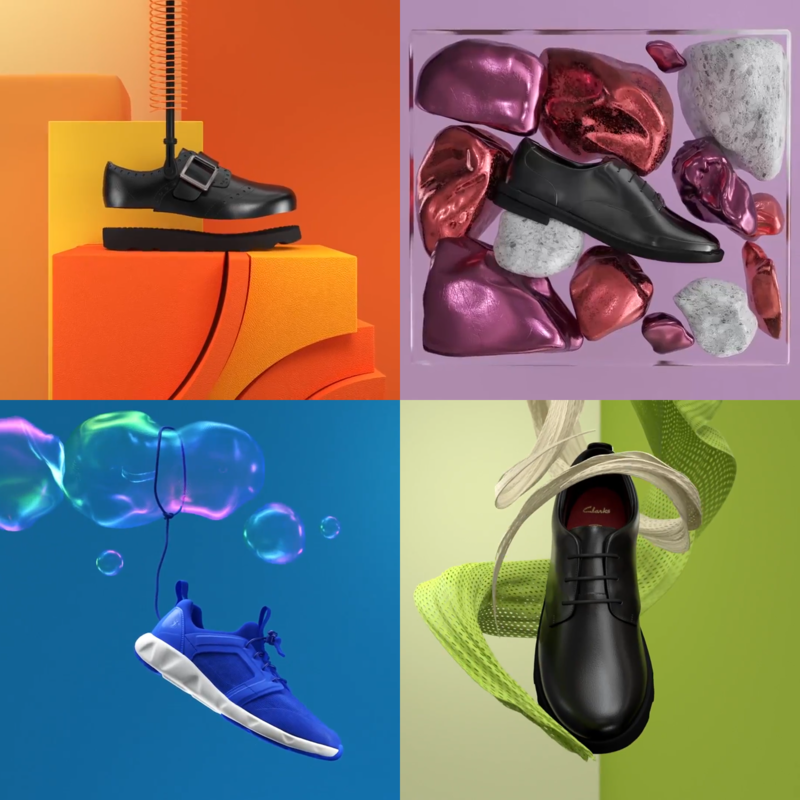 I recently finished working on a ‘Back To School’ promo series for Clarks, which involved lots of shoe scanning and even more ZBrush modelling. In this post I will briefly talk about the workflow I used and some tricks I learned along the way. 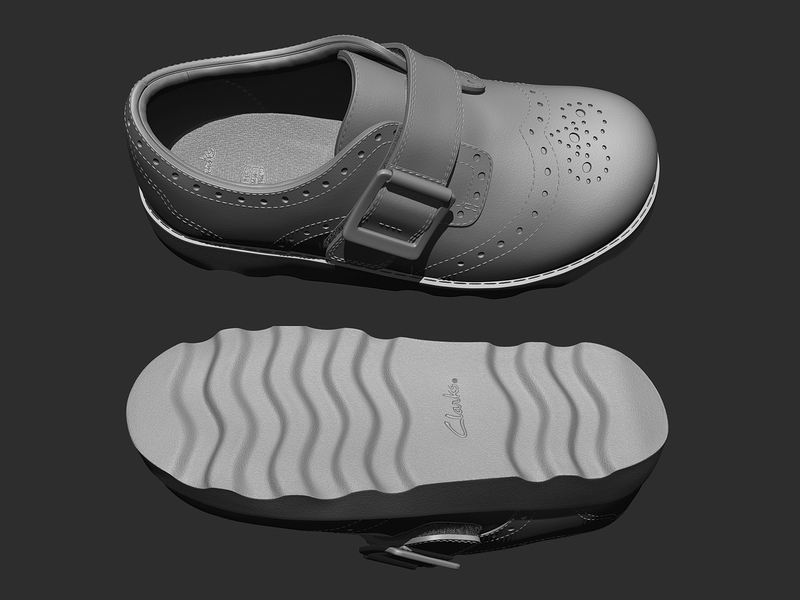 In order to achieve the best results I was asked to 3D scan the shoes and then remodel them from the raw data. To capture the shoes I used a photogrammetric turntable that I have been developing over the past two years. 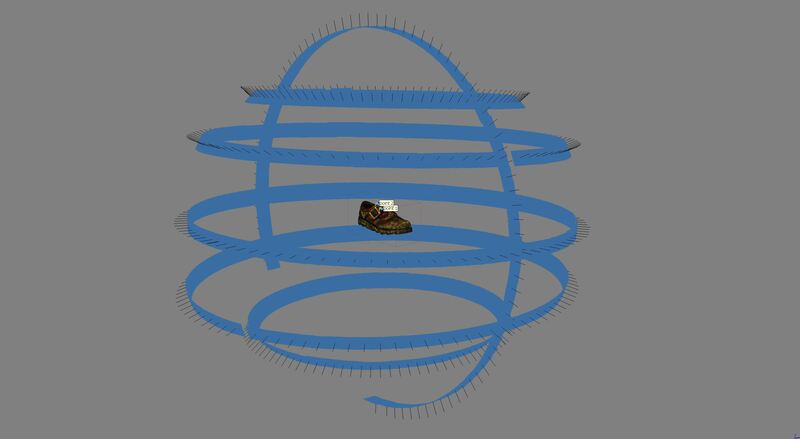 See below a video of the setup where you can see me doing some test rotations on a couple of the shoes. Note: this video does not show the final scans being captured. After running some tests I decided to cover the shoes with water colour paint to help create some surface texture and reduce the reflectivity. I would only recommend doing this if you have full disclosure from the client that the shoe does not need returning after the shoot. For processing the photos I used a mixture of both Reality Capture and Photoscan, and for remodelling I mostly used ZBrush and Maya. The initial retopo was split between a team of four of us, and the high poly surfacing/texturing was handled by myself. 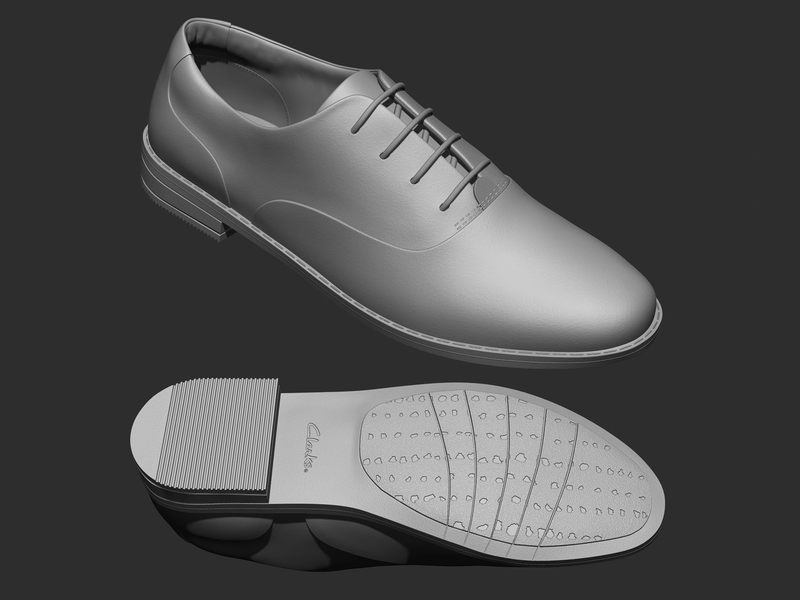 Due to the surface of these shoes being so smooth and shiny, it was quicker to rebuild them from scratch and use the scanned model as a reference. Usually I would try to at least project some mid frequency details from the scan. In this case the surface was so smooth it worked better just loading the retopolgised mesh into ZBrush, turning on dynamic subdivisions and using zmodeller to add support loops to create the correct curvature. I have found that when it comes to retopologising, switching between the tools in Maya and ZBrush can create an effective workflow. Using zremesher with ‘SmoothGroups’ can get you pretty good results, but then swapping over to Maya’s Quad Draw tool for manually fixing the edge flow to get you the rest of the way. There are also ways of doing topology fixes in ZBrush, however I personally find using Maya quicker for this kind of task. All the high poly surfacing was completed in ZBrush using alphas which I would either create in Photoshop, or using ZBrush’s NoiseMaker tool. I have found that the secret to getting a good alpha is to have an organised and clean UV layout. The best software I have come across for achieving this is Headus UVLayout; despite looking like an early 90’s game interface (see below), once you are familiar with the software I guarantee you will not look back. 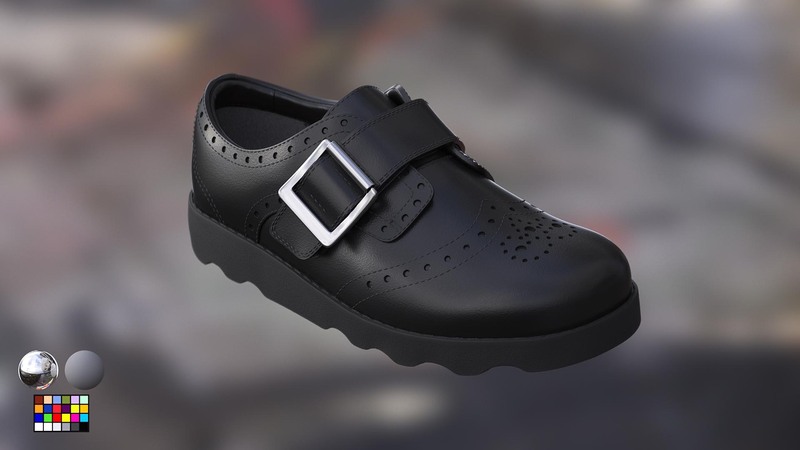 To create some of the more repetitive detailing on the shoes (i.e. stitching) I created my own IMM brushes which were repeated along a curve path. ZBrush allows you to create curves along the edge loops of a mesh, so if you keep detailing in mind when working on the retopology, you can easily generate a curve along the path of which you want to generate your IMM. 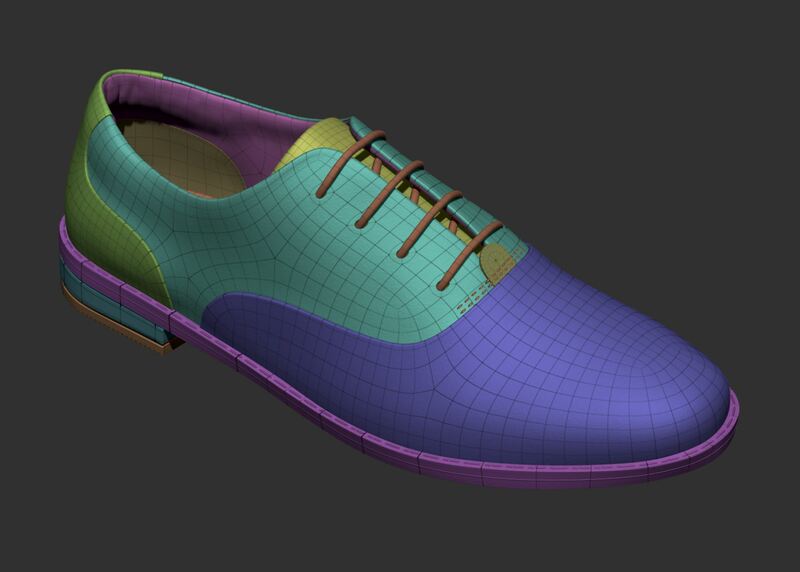 Overall, I am pretty happy with how the final shoe models look, especially considering we had such a tight turn around. If I were to improve on this workflow, I would like to look into using Substance Designer for generating surface materials. Hopefully over the next couple of months I will find time to work on a test piece using Substance Designer and post the results on here. See below one of the final sequences by Future Deluxe. To see all four final rendered sequences, click here.